In recent years traditional ideas of what success looks like have been challenged and today the smart/casual or ‘business casual’ dress-code reigns supreme. It seems very old fashioned wearing a grey suit or ill fitting shoulder pads in order to ‘power dress’ in the office and convey authority. In fact you can find great confidence in clothes you feel comfortable in that show some personality as well as showing respect for your bosses in the workplace. The way you dress at work can tangibly impact your performance and having a great wardrobe to choose from every day is massively empowering! If you like fashion, it doesn’t mean you won’t be taken seriously at work anymore, in fact being the most quietly stylish person will pay many dividends. A new year is a good time to re-assess - are your clothes looking a bit worn or are the cuts dated? Are you wearing the same things (or versions of) again and again? Are you nailing business casual with a wardrobe full of great separates!? Last week I detailed six of the key wardrobe staples needed to help create a strong capsule wardrobe - read it here. It’s the separates that form the building blocks of a great wardrobe and will give you varied outfit choices that look smart and stylish. Tailoring plays a huge part in having a smart wardrobe as does good quality fabrics. 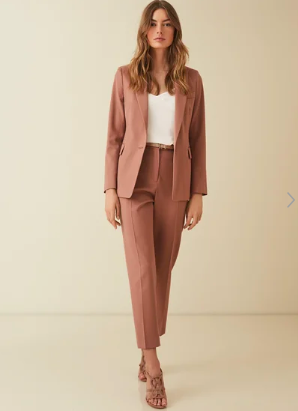 Moving back to this week, I’m sharing three strong work wear outfits for a business casual office that will give you gravitas and importantly joy because with all my serious waffling and chit chat - at the end of the day great outfits make you feel good! Outfit #1. Midi skirt, thin knit and ankle boots. I’m so glad it’s almost the end of January, it seems to have dragged on. I was so attracted to this gorgeous bright floral midi-skirt from Whistles - ‘anchored’ with a thin black polo neck or of you don’t suit polo’s then just a thin knit will do while it’s cold. Swap for a silk blouse when the weather warms up. 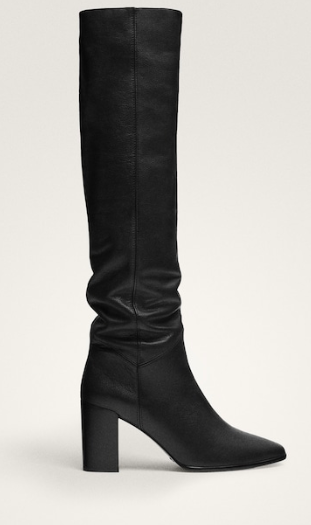 Ankle sock boots at LK Bennett - these are good because they hug the ankle. Affordable here. 2. Outfit #2. Even though an old grey suit with shoulder pads doesn’t cut it anymore a colourful co-ord suit like this does. Not in an 80’s ‘Working Girl’ kind of way but in a modern and up-to-date way. This is a bold choice I know - wearing kick flares is not for everyone. However you could do a slightly more tame version of this look with full length wide legged trousers instead. I just love the colour of this heritage print suit and again would wear with the ankle boots above or a pair of black suede platforms would be great. A thin knit is all you need underneath and I’d go for a very pale grey or off white. If the kick flare suit above is too racy for you or your work place try a suit in an unexpected colour instead. This blush pink is feminine and paired with the black heels and a black leather bag would look fierce. 3. Outfit #3. - Easy, comfy but smart dress. Massimo Dutti are excellent for work wear and this season have done some fantastic dresses that tick all the aforementioned boxes. Both the dresses below would look brilliant with a bright lipstick and a bright coat. Lisa Gillbe is a personal stylist and image consultant based in London. If you want help pulling together your wardrobe this spring get in touch here for bookings and enquiries.